It’s almost June, when my new book is to be released, and the media wants to know all about it. See below for upcoming shows. Use the “media publicity” link up top to book me for your show or go straight to KT Public Relations. Legendary podcaster Jim Harold quizzes me on my knowledge of dream symbolism and probes the paranormal side of dreaming. Stories on Creativity (and Dreams) w Bryan Aiello, a wide ranging talk about Carl Jung and dreams in storytelling. I'm the author of "Dreams 1-2-3: Remember, Interpret, and Live Your Dreams," and "The Dream Interpretation Dictionary: Symbols, Sign and Meanings." At reddit.com I'm known as RadOwl. I began studying dreams in the early 1990s and delved into all major schools of thought, especially the writings of Carl Jung. 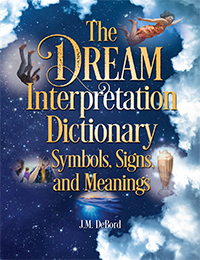 "The Dream Interpretation Dictionary: Symbols, Signs, and Meanings." Your all-in-one guide to dream interpretation, encyclopedia of key concepts, and dictionary with clear and thorough explanations. Dream Interpretation Dead Parents and Relatives. Is It Real? Pregnancy Dreams Interpreted: What Do Pregnancy Dreams Mean? Mom Is Murdered in a Dream. What Does It Mean? Dream Interpretation – the interview heard around the world! J.M. DeBord Dream Interpretation © 2019. All Rights Reserved.